If you haven’t heard the news already, I’m leaving my apartment of over 6 years and moving back to Palm Springs! As I pack up each room for the move I’m reminded of how many faces each one has had over the years, and how we started out here with literally only an air mattress and a laptop. I worked hard to make this apartment feel like our own home and did every thing I could to personalize it within the limits allowed. In the beginning I worked with what I had and could afford, which wasn’t much, and slowly improved each room over the years and brought in new and better things to make it what it is today. I had fun doing it and I’m really proud of what I’ve done and been able to share with you all since the blog started. I thought it would be fun to take a little look back through the years. Each rooms has looked even more different than what you’ll see below, but this is what I could find on my Instagram and photo archives. The living room and dining room have always been the main focus. It’s where we spend the most time and really the only room people see when they come over. It started out with ugly paint and carpet (the floors were eventually changed by management) and eventually turned into a bright and spacious feeling room. It was even featured in Better Homes and Gardens! As you can see I flipped the entire layout last year. The dining room has had a few different lives too. Here are a couple of my favorites. Even the front door got a makeover a couple of times! And lastly, the bedroom. I went from garden grandma chic vibes to tropical resort vibes. I’ve had a lot of fun living here and sprucing this place up, but I’m excited for something new! Stay tuned for projects in the new place soon! I’ve said it before but I feel like this month has flown by. I honestly wanted to do a little more decorating but ran out of time. Boooo. I did manage to get all of the necessities in here though! Christmas Tree: check! Bottle brush trees: check! More Christmas trees: check! I’ve realized this year that I have a thing for Christmas trees. In the dining room I used large bottle brush trees from Target to decorate my shelves and then stuck in two more baby trees for good measure. I got a little more festive on the adjacent bar, of course. I used Shiny Brite ornaments and epsom salts to dress up a cheapy $5 plain wreath and garland. The living room is definitely the most festive place in the apartment! I spy a DIY corn husk wreath over the fireplace. I also decorated the fireplace with my collection of bottle brush trees and DIY Putz Houses. And then there’s the tree! I’m going to miss this when it’s gone. I got this hat for my dog but she hates it so Frank the flamingo got a festive little makeover. 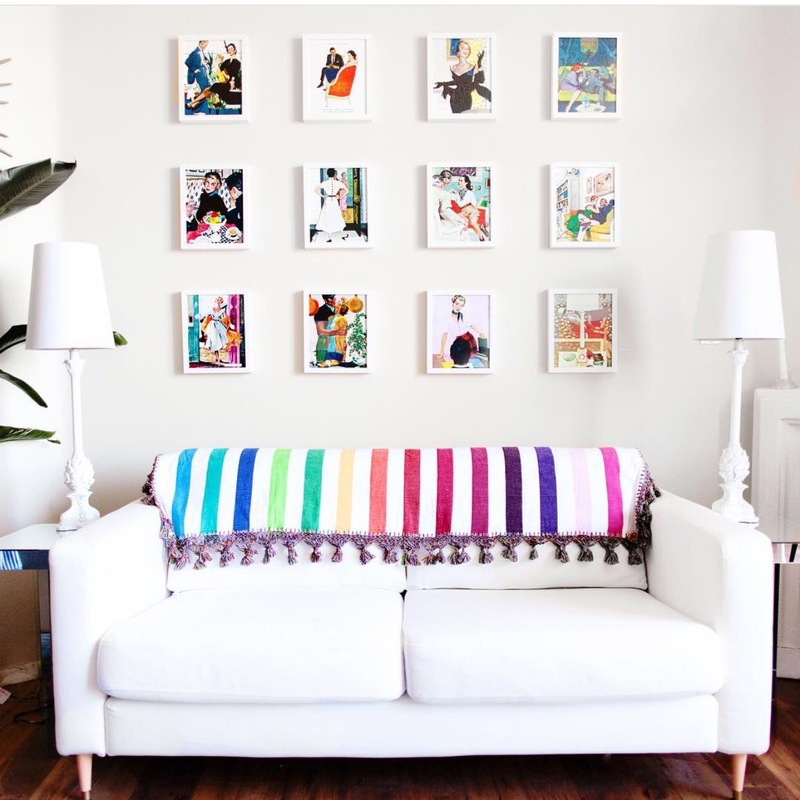 These DIY pom-pom pillows dressed up our little IKEA Hack bench. I made these for Christmas but I think they’ll end up sticking around all year. I didn’t get much decorating done in our bedroom, except for this little gold tree that holds our personal, heirloom, and travel collection of ornaments. I used a faux fur throw as a tree skirt and hung a cute little DIY Christmas print on the wall. The lighting from this tree is super cozy and great to have on during bedtime Christmas movie watching AKA my favorite winter time hobby. That’s it! Thanks for stopping by and Happy Holidays! Xoxo! 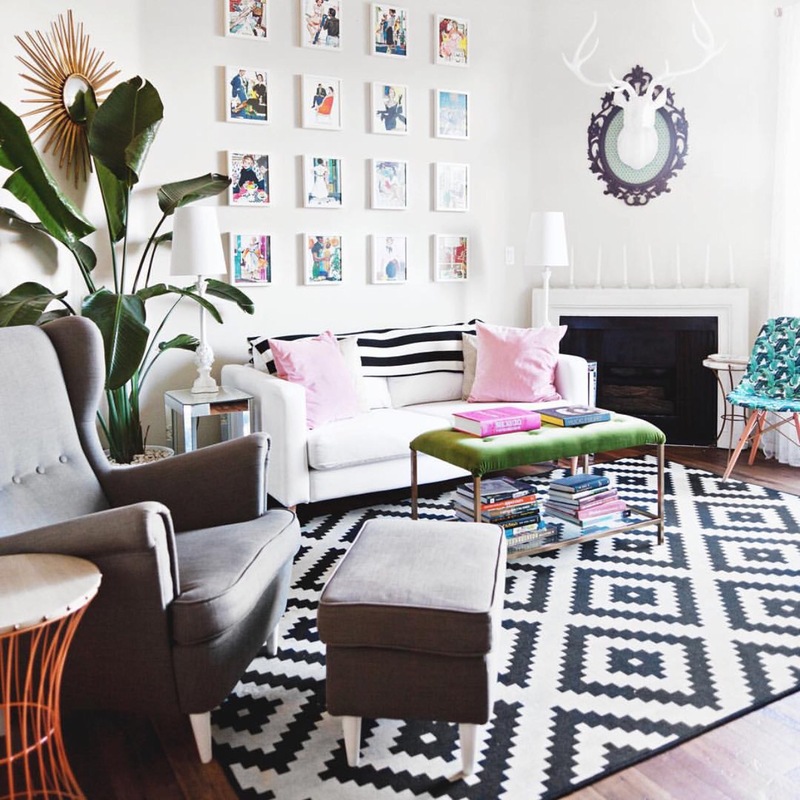 When I started redecorating my living room I had no idea that a new rug would be one of the most difficult things for me to find and decide on. I don’t know why, but I just couldn’t narrow down and pinpoint what I wanted. I think it’s because there is just SO MUCH variety out on the market, sifting through rug after rug got overwhelming and I kept putting it off and getting cold feet about my contenders. I kept wishing I could just tell someone what I had in mind and have them do the leg work. Well, my wish was granted! Hamlet does exactly that. Better yet, it’s all through text message and the service is free! All you have to do is text 646-586-2260 and you’re connected with a personal stylist that is ready and willing to help you find everything you need to decorate your home, from rugs to accent pillows to sofas. After a few quick questions my Hamlet stylist, Cyrus, sent me 4 amazing rug options based on my needs, and helped me choose and purchase the perfect one in less than 20 minutes all through my SMS screen. It was so much easier than the hours I’d spent in stores and online trying to make a decision. Everything went seamlessly! My new rug arrived and was exactly how it was described by the stylist. Perfect size, color, style, everything. I’m SO happy. Something I do when I’m decorating a room is try to use what I already have. I’ve had this mirror in my dining room for a couple of years and when I decided to redecorate I thought about where I could use it rather than get rid of it. I got it for $20 on Craigslist and although it isn’t actually a pricey antique, it’s still a good deal for such a solid and large piece. Originally it was painted an antique gold finish but that didn’t fit into my decor scheme at the time. To remedy that I did a silver metallic faux finish on it. I decided its new home needed to be in my living room above my fireplace and also wanted it to be a pop of color. I looked through all my spare paints and decided on a cheerful yellow. All I had to do was brush on some white primer, then a few coats of yellow paint, then a coat of clear polyurethane to give it a glossy, candy-coated finish. I think it gives the wall a nice, bright feeling and ties in with the rest of the colors in the room. The best part is I spend no money because I already had all the materials! Yay! One project down…lots more to go. 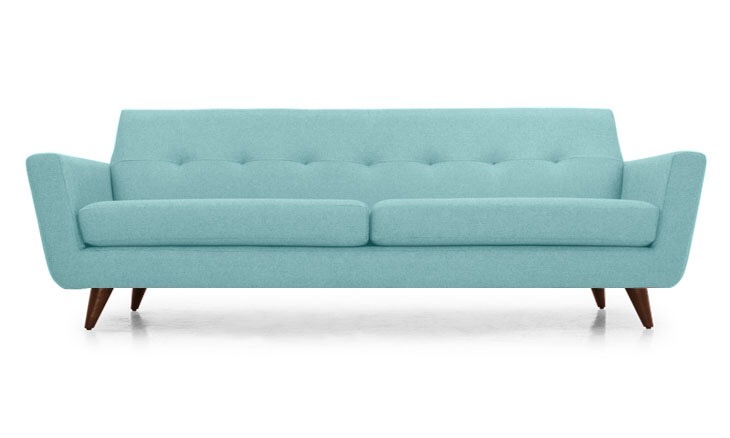 Now that I’m redecorating my apartment I have to find new furniture that not only fits my space but also fits my budget. 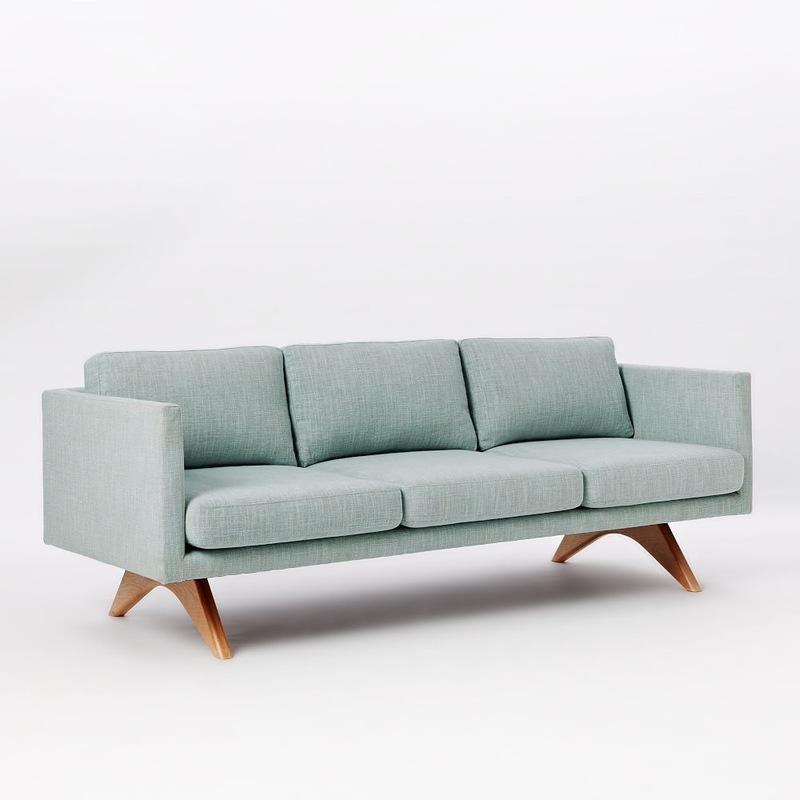 Since I tend to redecorate a lot I don’t usually like to spend too much money on pieces that I know I may change out in a year or two, but sofas tend to be expensive. 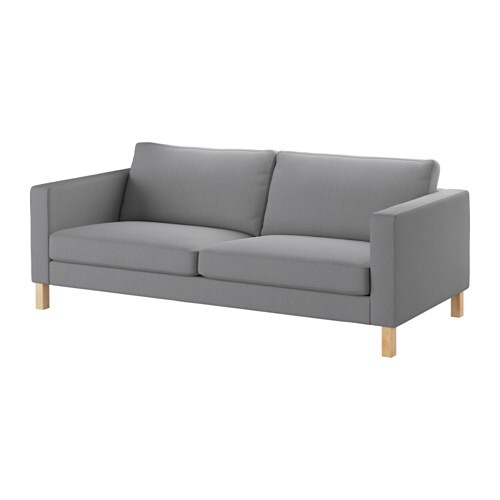 Up until now I’d been using a KARLSTAD loveseat from IKEA (now discontinued) as my main seating area. At first it was meant to be a place holder until I found something else, but after I changed the legs and accessorized it a bit, it fit in perfectly and served its purpose without any problems. 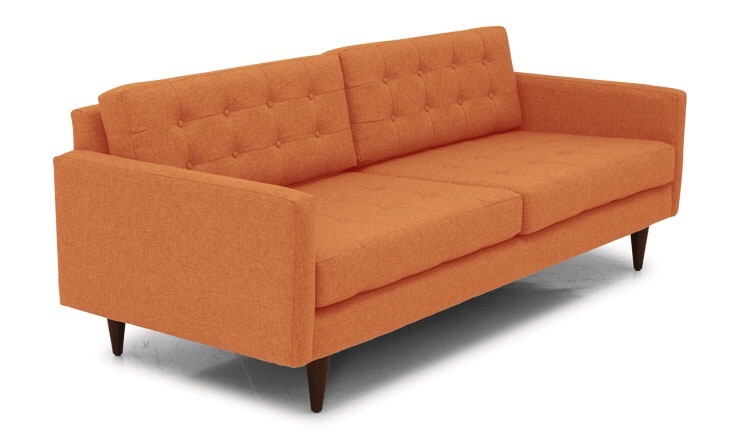 I’m rearranging my furniture placement and plan to put a sofa against a larger wall in the room. 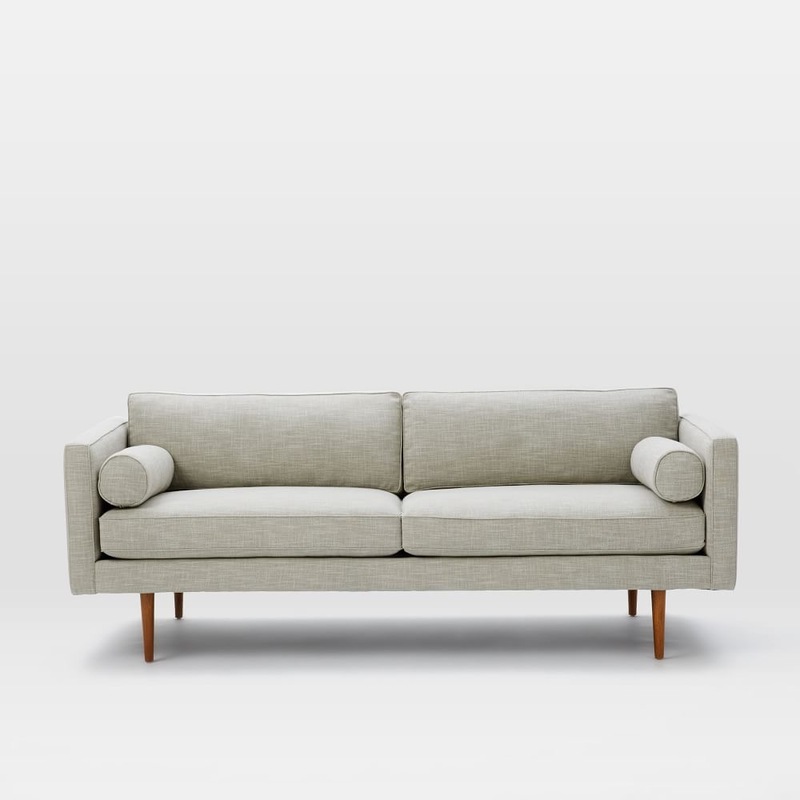 The KARLSTAD loveseat looked tiny and awkward against the new wall so I figured it’s time to upgrade and get a new sofa. I’m all about mid-century styles, and luckily I’ve found some good sources that have several great options. Here are some of my current favorites. All under $2,000. 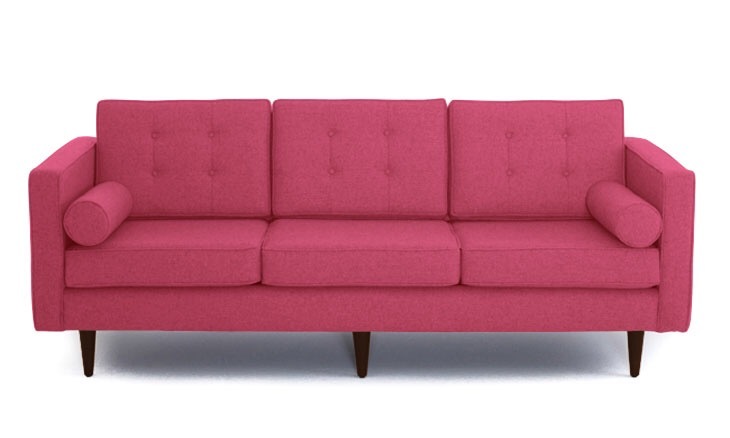 Joybird– Joybird obviously has a love for design from the 50s and 60s. 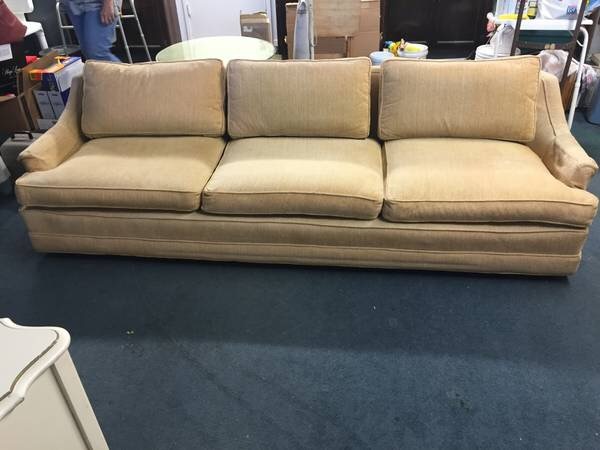 They have a large selection of sofas from straight and modern, to tufted traditional, to the wacky lines of the atomic era. Not only do they have a large selection of styles, but the selection of fabrics they’re available in is incomparable. They send you FREE swatches at the click of a button, and in my opinion their upholstery options are the most authentically vintage available. Bryght– Bryght is a new on my radar but I like what I see. They provide high-end style at a decent price. Although they don’t have a large selection of bright, colorful fabric options, they do have velvet options which is nice. 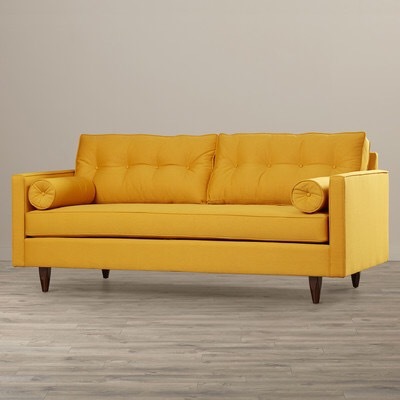 Wayfair– Wayfair doesn’t exclusively offer mid-century inspired styles like the sources mentioned above, but they do have a great selection of passable high-end designer styles and colors at deeply discounted prices. 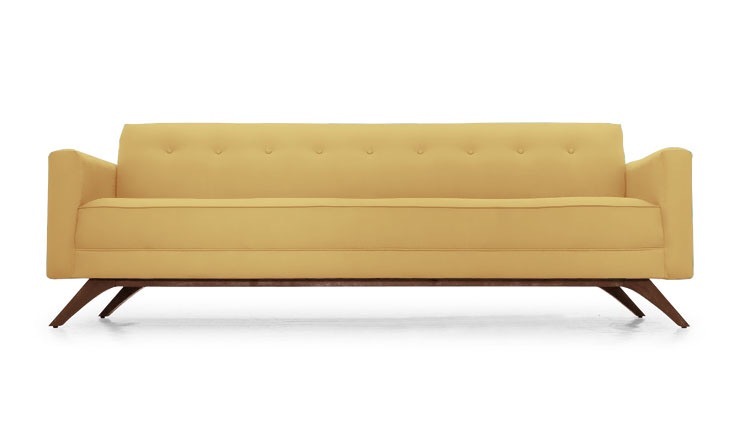 West Elm– West Elm has a couple of styles with a vintage vibe I like. 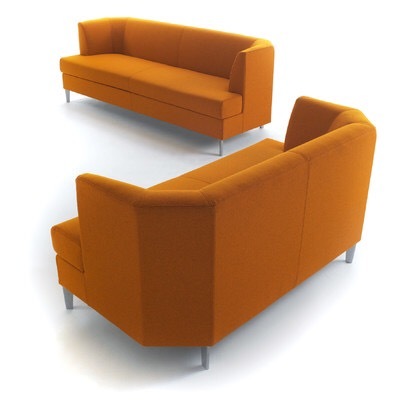 The first has the modern, shelter frame, and the second has boomerang shaped legs that can give off an atomic vibe in the right color. IKEA– Good old IKEA! 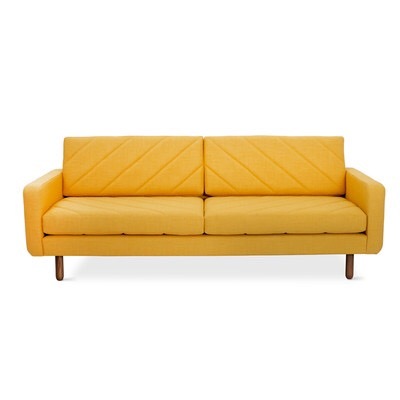 Like I mentioned above, I’m upgrading from a KARLSTAD loveseat. I’m no stranger to an IKEA Hack and I’m confident that with a little effort and changes I could save a lot of money and turn this option into something more stylish. At only $400 it’s very tempting. Even as something temporary until I find a true vintage option. 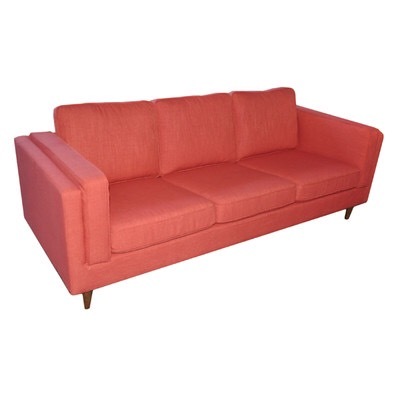 Thrift Stores/Flea Markets/Craigslist- Another option is finding a second-hand, true vintage piece. I live in an area where vintage is a hot commodity and the good deals get swooped up pretty quickly. 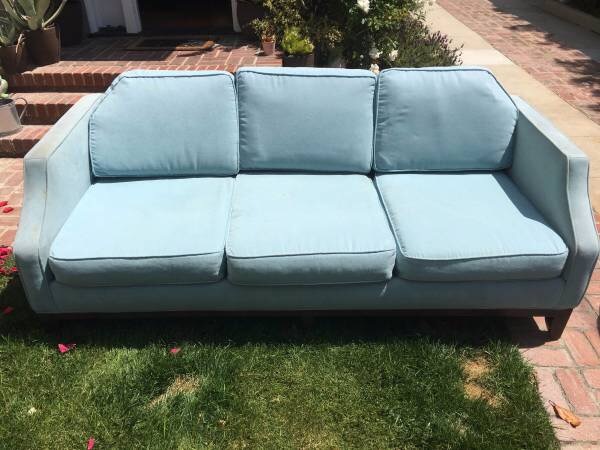 Often times between the cost of the couch and the cost to reupholster, it ends up way out of my budget anyway. I’m always lookout for an insane deal though! Which is your fave? Updates soon with the one I pick!